Every spring, thousands travel to Moab for "Jeep Week" and Easter Jeep Safari: a tradition of off-road riding on the area's beautiful trails and rugged roads. While fun, events in some areas create a lot of garbage, and lead to soil erosion and native plant damage. Since 2005, Common Thread/Operation Cooperation has worked to maximize recycling and limit this damage, and to foster cooperation among different land users, especially at Potato Salad Hill. 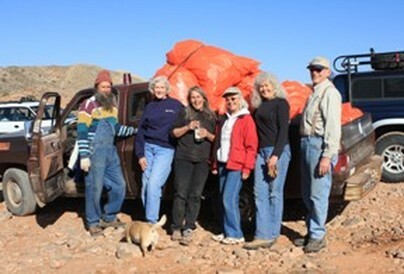 For ten days leading up to Easter, Moab Solutions volunteers join other volunteers each morning to remove trash and recycling from "Potato Salad Hill," a popular party spot. The recycling alone from one day weighed almost 400 pounds! Each year new people join us. We'd love to have you! Call us at 435.401.4685. Common Thread is a cooperative effort between Moab Solutions and the Grand County Sheriff’s Office, The Solid Waste District, the Bureau of Land Management (BLM), Grand County Trail Mix, (a Grand County sponsored committee), the State of Utah Schools and Institutional Trust Lands Administration, (SITLA), as well as the off-road group, Rocky Mountain Extreme. Its main goal is to get a variety of volunteer groups working together to help prevent damage to the land during large off-road events. Together, we remove recycling and litter from a number of areas, share information with visitors about the special cryptobiotic soil crust found in this region, explain the value of the “Leave no Trace” philosophy, and provide other helpful information. Off-roaders shatter environmentalist perception in Moab, Utah. The National Advocate, Winter 2015. Torchmate Racing Helps Keep Moab Beautiful. Offroadpress.com, 4/10/12. Easter Jeep Safari was early this year, so nobody seemed quite ready for it! We did work to make sure the rock outlines were clear, that a recycle station was installed, and that the trash and recycling was picked up everyday. Staff reports a very mellow, family oriented feeling at the hill, a place that was once a drug-fueled mess. One sad issue was that land that had been untouched for several years, and was self-seeding and very healthy, was used, for one day only, as a parking area. I raked and swept out tracks for about 4 hours during and right after the Easter weekend. Very sad to see crushed plants and healthy soil decimated for no real reason. Our shuttle service, free to users, was available to take people up to and down from PSH on Saturday. We hope next year will be better, as this whole project aims to get diverse groups working together to protect the land and allow the area to stay open, even thought it is an ACEC (Area of Critical Environmental Concern) on BLM land. Let's all be good neighbors to each other and use common sense to guide us. The photo above shows the recycle bins, with some new special signage, painted by Moab's own Pimo - Pete Apicella. Thanks Pete! We faced several challenges this year, but we still ended up with a highly successful event. I did not receive any funding this year, so I had to scale back on advertising and do more of the physical labor than normal, but it worked! We barely had to rake out any tracks, and the staff had a wonderful time interacting with the crowds at the "hill". Thanks to Abby Scott, for volunteering her time to us. She is a bright and shining star. ​We look forward to continued success with minimizing damage and maximizing recycling in 2018. Come join us! We had the most successful year ever in 2016. A grant from ORBA enabled us to run a free shuttle on Friday and Saturday, place ads, hire staff, and buy pocket ashtrays to give away. Staff manned the recycle station and walked through the crowds collecting trash and recycling. There was minimal damage to the land, and maximum recycling. We appreciate ORBA's generosity and look forward to working with them again next year. We really turned a corner in 2015. For the first year ever, thanks to the fund raising efforts of Jeff Knoll, we had funding sufficient to launch a free shuttle service to Potato Salad Hill, place ads in the paper to announce the shuttle, hire paid staff to work with volunteers collecting trash and recycling, as well as maintaining the recycle station, and gave away free reusable shopping bags. We are looking forward to building on our 2015 successes in 2016! 2014 was a year of great successes at Potato Salad Hill. Volunteers did rock outlining of the trails and other prep work prior to the big weekend. We received a small grant from the Leave No Trace foundation, and a donation from Moonflower Community Cooperative to cover some of our expenses. We hired three people to maintain the recycling station we installed, displayed information about the native flowers, and walked through the crowds with buckets to collect trash and recycling for several hours on Friday and Saturday. The crowds loved it! The Solid Waste District donated some boulders and the manpower to install them in an area we were trying to protect. Special thanks to Robin Zank, whose support in 2014 made this project possible. She made a beautiful display using photos donated by Linda Whitham, lugged heavy bins in and out of the truck, helped with drop-offs at the recycling center, and kept us on an even keel. Thanks are also due to Solid Waste District Manager Tom Edwards, Grand County Sheriff Steve White, Canyonlands Community Recycling Program Director Abby Scott, and all the off-road enthusiasts who volunteered to do cleanups every day--especially Jeff Knoll. Moab Solutions' volunteers Linda Whitham, Lenore Beeson, Frank Stewart and Abby Scott were also indispensable. They helped make rock outlines for months before the event and/or raked out stray tracks during and after. Finally, our paid crew did a fantastic job too. Thanks to the mother-daughter team of Adrienne and Hanna for the work they did on Friday and Saturday evenings. Our community service worker, Kelvin, was a big part of the preparation and repair work.